Entrepreneurial behavior is deep in my BRAIN’S operating system……. Thank you Andretti Racing Experience for giving me an answer. I drove to the edge and the edge was just a little further than the instructor let on…..no shame on Andretti Racing. And an honest run by me. THE STORY AS I WROTE IT BEFORE HAVING TO DEAL WITH THE Customer Service…. So, yes I added the text and printed a nice 13×19 print for myself. Bad habit, tell me it can’t be done and I do it anyway. Trying to get the video up. Well, what level that is I don’t know but! The instructor told us that the cars would 150mph. I groaned as my mark was to make or break 150mph. Not sure if I have driven over 100mph before. Ah, I had a chance. 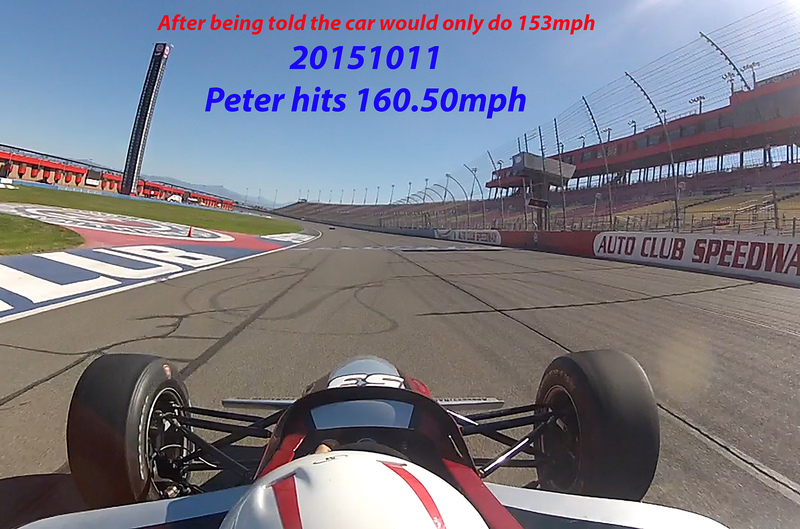 150mph was reachable…… tough, maybe just barely………. I had 2 runs of 8 minutes each. the first was my practice, the 2nd would be my Qualifying run so to speak. I did what I was told and the spotter quickly saw I was able to drive and let me open it up. I was hitting the Rev. Limiter in the turns and trying to get the feathering down. I agreed and tell him, yep 1st was practice, Now Qualifying. Let’s do it! I in it and on it when he gives the OK…….. I wish I had the audio, I’m not sure but it almost sounded like the guy was cheering me on, Not coaching me…. Anyway, I got to pass people twice, and when you are in the race car you don’t have anything to tell you how fast you are going, not even a tach. So, YES MY JAW DROPPED! when the lady handed me my certificate with 160.50mph. The certificate they give you and down there it is 160.50mph. On a double. So I made me a photo, and with this certificate will hang on a wall for a while……. a dream as a 7 yr old, Formula One is what I wanted, a road course would be Much more fun. But heck, beating the speed limit was a great finish………one less on the bucket list. 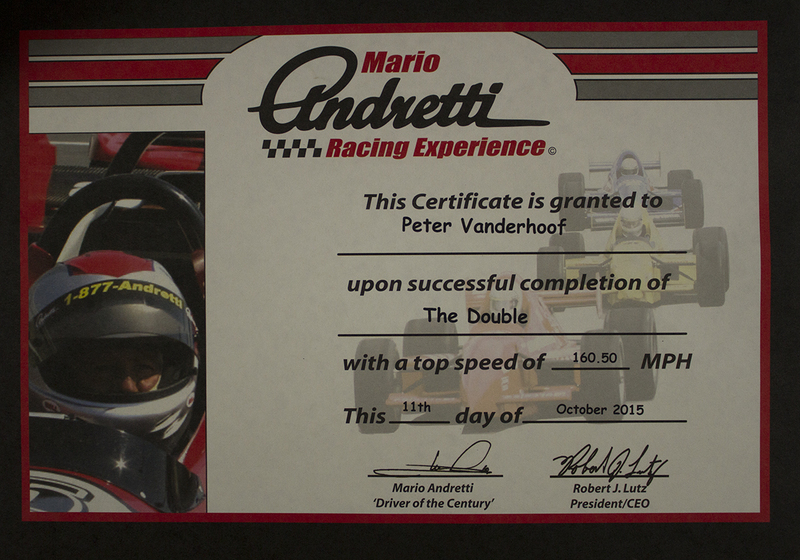 20151013 UPDATE: OK, so I got to feel like a top driver…….I have asked Customer Service at Andretti Racing Experience for the engine stats of the car I drove. As a business person, I know they will have this for at least 90 days just in case someone drops dead from a stoke or heart attack after a drive. Standard liability insurance. Have not heard back. As far as I’m concerned I got POLE in My Race, wanted 150mph. Hit 160.5mph. However it works out, I have a nice memory of the ride……video to amuse myself with (boring otherwise). AGAIN, MANY THANKS to Andretti Racing Experience. 20151015 UPDATE: 3 calls and an email later. Still have not heard anything back. Guess I will never know at this point. I would have thought someone would call given I did the “upgrade” speed on a double ride. The computer print out I am willing to bet is a simple spreadsheet fill in. Employee looks up name, computer puts in data to certificate, employee prints out and tells person “Congrads on ??? speed.” Hands certificate and goes to next customer. Nothing to misprint. Personally, I guess I get to believe I am an ace driver a little while longer. Let you know if anyone tells me anything. Not sure if or how long a message will take to reach someone who is interested in the answer. 20151026 UPDATE: I sent emails off again…..3 different addresses…….. The driver of the car complained of the lack of handling in the car, so I told him I would look at it. I quickly realized that it needed a tune-up in a MAJOR way……..the 4 tires technically did NOT POINT in the same direction. I spend a couple weeks tuning it up, added some Weber side draft carbs and handed it back to the driver. But that Lotus……I drove it in Riverside raceway PIT, to make sure the throttle response was OK……so the DRIVER could take it on course. tap…..zoom, tap… zoom. If I made 20mph before hitting the brakes………5 minutes from getting in to getting out and offering to the driver. So no I have never been on any race course, as a driver in any capacity. I did drive Malibu Grand Prix Go-Carts once also, about 1977. I have owned one car with a v-8, all the rest are 4 cyl. and the closest to a sports car was my 1972 pinto! UPDATE 20151031 Happy Halloween……….to Mario Andretti Racing Experience, who’s Customer Service is having a hard time explaining top speed in racing to me, please your boss or any driver, racing car engineer/designer, if I kind of have an idea of what a “top speed” is and what it is to achieve it. “Top Speed” of a car is achieved when that moment where the driver is no longer pushing down on the gas pedal, the engine relaxes, so to speak for a couple of thousands of a second. The run down the longest straights with the DRS engaged will result in the highest speeds. DRS, Drag Reduction System is a computer controlled flap on the rear wing. When open, it lightens the down force on the whole car, but mainly the rear wheels to put more horsepower to forward motion instead of downward loading, aka grip. Speed increases in excess of 10mph are achieved by the DRS. Upon stepping on the brakes the DRS closes and instantly the car drops in speed, Even before the braking action of the driver’s foot on the brake. Thereby dropping from “Top Speed”. However, “Top Speed” and “Average Speed” are very different, F1 cars go from 0 to 100mph and BACK to 0 in 6 or 7 seconds, therefore as the cars go through the road courses speeds vary and lap time speeds will be much lower than “Top Speeds”. Indy is similar. Even on Oval tracks, in the turns, some of the energy is going into holding the race car on the track, the speed should be lower.